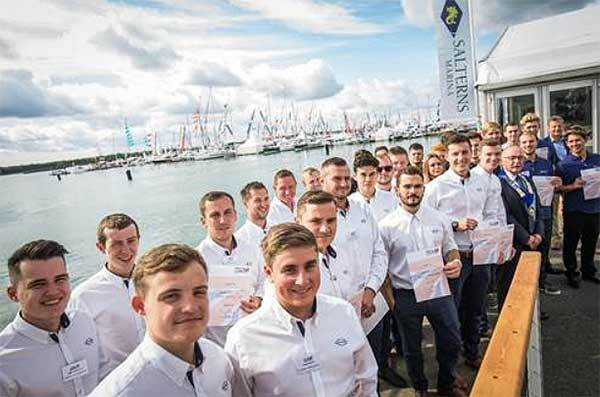 Thirty four apprentices took centre stage on Tuesday (19 September) as British Marine, the membership organisation for the UK leisure, superyacht and small commercial marine industry, honoured them at its annual Graduation Ceremony at TheYachtMarket.com Southampton Boat Show 2017. In its seventh year, the ceremony celebrates graduating apprentices from all areas of the industry, in roles varying from marine engineers to non-marine specific disciplines like I.T. and Business Administration. Apprentices from eight member companies were recognised, from Berthon Boat Company, C-Quip, Golden Arrow Marine, Offshore Performance, Princess Yachts, RS Sailing, Spinlock and Sunseeker International. The marine industry now has over 500 apprentices working and learning in 100 businesses. British Marine is working with an industry led working group to develop a range of the Government’s new Trailblazer apprenticeships. There are three of these new Trailblazer Standards in operation within the marine industry – Boatbuilding, Marine Engineering and the newest offering, Marinas and Boatyards. These new Standards are developed by groups of employers, training providers and colleges to ensure that they meet the full needs of the industry. Apprenticeships are firmly at the heart of both the industry’s and the Government’s plans for skills development in the UK. The new Maritime Minister, Rt. Hon. John Hayes CBE MP, has challenged businesses to double the number of apprentices they employ and “discuss how apprenticeships can help them succeed by growing the next generation of talent”. A sentiment that British Marine whole-heartedly shares. There were also two special awards at this year’s ceremony. Keith Longman, Yard Manager at Berthon Boat Company received an award from British Marine, recognising his efforts in developing these new training standards for the industry. And the British Marine Trades Association (a group association within British Marine) presented their first Non-Technical Marine Apprentice of the Year Award to Alex Bere, a business administration apprentice at C-Quip, based in Fareham.